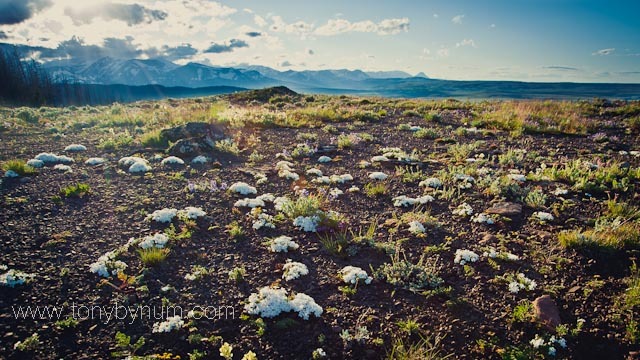 Glacier National Park is coming alive. I can still see twilight over the mountains at 10PM! Yeah . . . By the end of the week I expect to see some balsam blooming. Already the lower ground flowers carpeting the lithosols are blooming! Flowers bloom on a well drained lithosol. Glacier National Park in the Background. Nikon d700, 17-35 afs, f16. © tonybynum.com All Rights Reserved. People are beginning to show up, some tourists, but mostly workers. This past weekend things really started buzzing around East Glacier Park, but deeper into the park, you'd think no one knew about the place, it's deserted, well, almost . 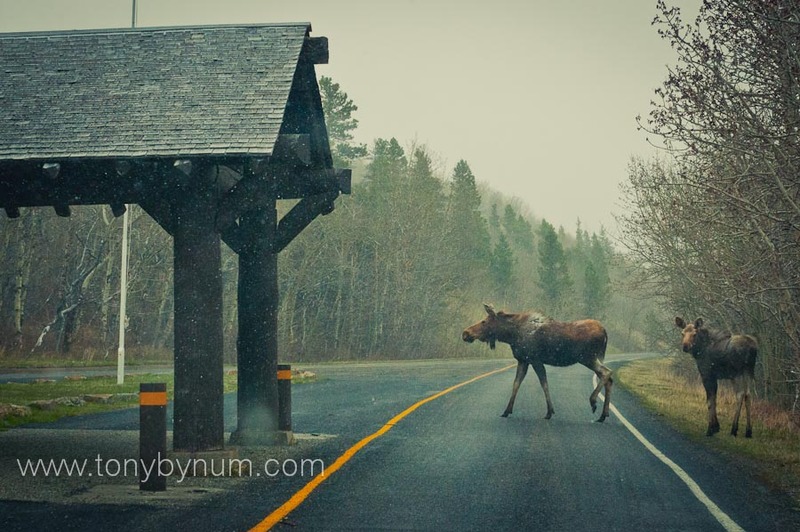 . .
A cow moose and her calf from last year cross the Many Glacier Road in Glacier National Park, Montana. Nikon d4, 70-200 afs vr lens. © tonybynum.com, all rights reserved. 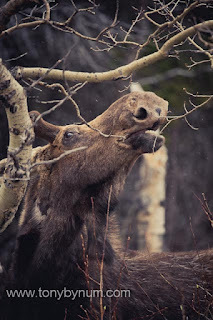 Bull moose eating new buds, Glacier National Park. Nikon d4, 200-400afs VRII @ f5, iso 400. I love this time of year. By our standards it's spring, by most other's it's still winter, but spring in Glacier National Park is all about change and life! New life springs up around every corner. Plants begin to reach for the sky, animals feed more comfortably on green food. Moose and elk are growing new antlers and grizzly bear cubs sharpen their skills! It's a all about life! Life happens to us, not for us! Go live it! For those that care, I mean really care about this place, consider calling your congressman and tell them to vote no on HB 1505! If you've still not checked in with my facebook page, please do, you still have time to win the glacier park book, "the first 100 years," and my signed print of the cover photo. Gt to Tony Bynum Photography's facebook page and check it out!